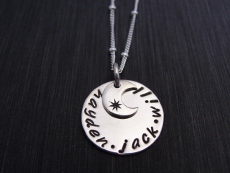 A sterling silver disc is stamped with lowercase font around the edge of the disc and then layered with a moon and star charm. The disc can accommodate up to 17 letters. The discs are hung from sterling silver "Satellite" ball and link chain which come in 16" and 18" lengths. Hip Tip: Who are your Moon and Stars?